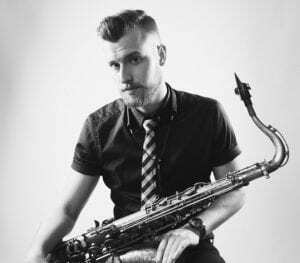 Dan White is a saxophonist, composer, and educator based in New York City. He has toured internationally and released five albums as a bandleader. He is also best known as a founding member of the horn led instrumental group Huntertones, who was selected by the U.S. Department of State to engage international audiences, students, and artists from around the globe as an American Music Abroad and Arts Envoy Ensemble. On September 30th, 2016 Huntertones will release their second album, ‘Live.’ This record captures the band in it’s element, performing genre-bending music while feeding on the energy of a hometown crowd. White has performed with award winning artists such as Allen Stone, Snarky Puppy, Andy Grammer, Felix Pastorius, John Clayton, Arturo Sandoval, and platinum selling rock band OAR. Downbeat Magazine, NPR Music, Huffington Post, the Rochester Jazz Festival, and the U.S. State Department have each recognized his music. White grew up just north of Buffalo, where he started playing piano at age eight and saxophone at age nine. After attending a Joshua Redman in concert with his father, he was instantly hooked on jazz. Having a family with extensive roots in music helped create White’s deep-seated respect for acoustic jazz and the link between composition and improvisation.